Initially, leaves of infected plants wilt during hotter times of the day, but eventually, the wilt becomes permanent (Image 1). Initially, one or a few vines of a plant are affected, but eventually the other vines wilt and the plant dies. 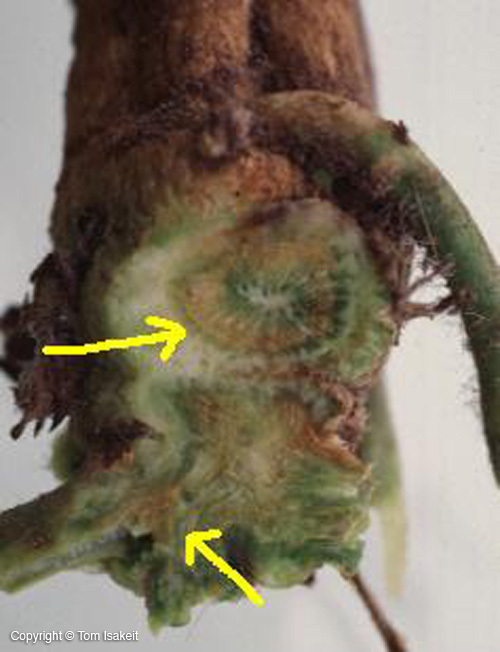 Other agents can cause plants to wilt. For example, anasa wilt is caused by the feeding of the squash bug. 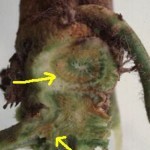 The fungus causes browning of the xylem (water-conducting tissue) of the crown and runners (Image 2). 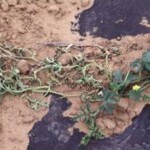 Races 1 and 2 of this fungus are present in several watermelon-growing areas of Texas. Most commercial cultivars have resistance to to race 1, but not race 2. The fungus persists many years in soil, so watermelons should not be replanted into infested soils for at least five years.